Toss beets and carrots with 2 tbsp oil, and sprinkle with sea salt. Wrap garlic in foil packet and drizzle with 1 tbsp oil before sealing. Arrange veggies and garlic on rimmed baking sheet and roast 45 minutes or until vegetables are tender and edges are golden brown, flipping veggies halfway through cooking. When garlic is cool enough to handle, squeeze cloves out of papery skin and set aside. Place beets, carrots and garlic in a food processor and pulse until broken down a bit. Then, with processor running, drizzle in ½ c oil, honey, ¼ tsp sea salt, cumin, coriander, smoked paprika and lime zest and juice. Season with sea salt, to taste. Transfer mixture to a serving bowl and top with feta, parsley, and chives. 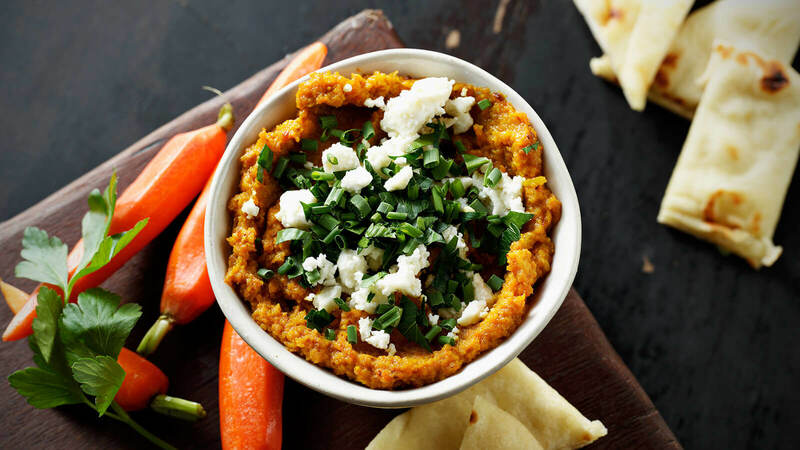 Serve with pita, naan, flatbreads or The Fresh Market French Rounds.